Preheat oven to 350°F. Grease an 8x8 baking dish. Slice the guava paste and cream cheese into 1/4-inch thick slices; set aside. In a large bowl, whisk together flour, baking powder and salt; set aside. In a large mixing bowl, cream butter and sugar on high speed until light and fluffy. Add eggs one at a time, beating well after each addition. Stir in vanilla and almond extract. Add dry ingredients and stir just until combined. Divide dough in half and spread half into the bottom of prepared pan. 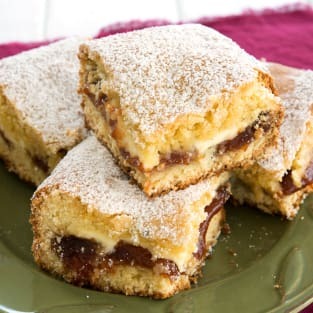 Top with slices of guava paste in a single layer. Add cream cheese slices evenly spaced on top and cover with remaining dough. To make this easier, add dollops of dough across the top of the cream cheese and carefully spread the dough to the edges until completely covered with no gaps. Bake for 40-50 minutes, or until fully set in center of cake. Let cool on wire rack. Dust with powdered sugar before serving.